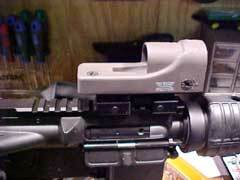 DPMS of St. 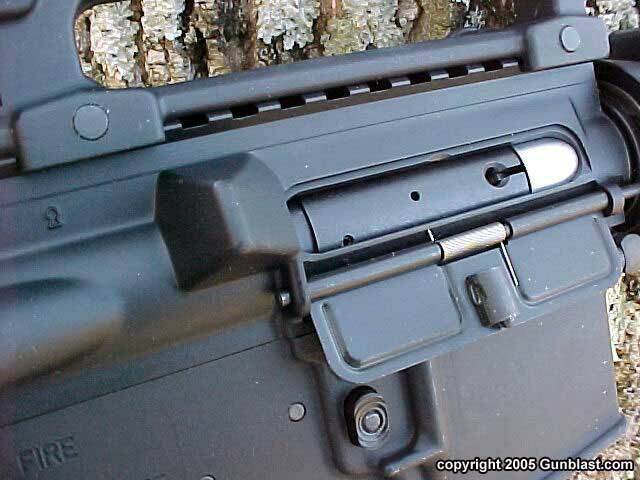 Cloud, Minnesota produces an extensive variety of AR-15 and AR-10 type rifles in 5.56 NATO (.223), 7.62 NATO (.308), and .300 SAUM, selling them at prices that usually beat their competitors by a good margin. Their rifles are of high quality, and have exhibited very good accuracy and excellent reliability. 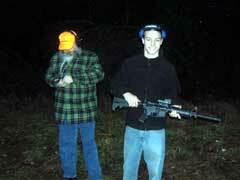 We have tested a few of their rifles here on Gunblast.com, and they have always performed well. 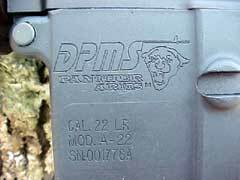 Recently, I received from DPMS a Panther AP-4 chambered for the .22 Long Rifle cartridge, and that is the subject of this article. 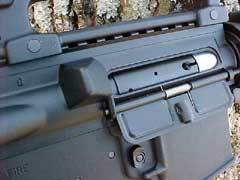 Upon opening the hard plastic case, I was immediately impressed with the fit and finish of the rifle. 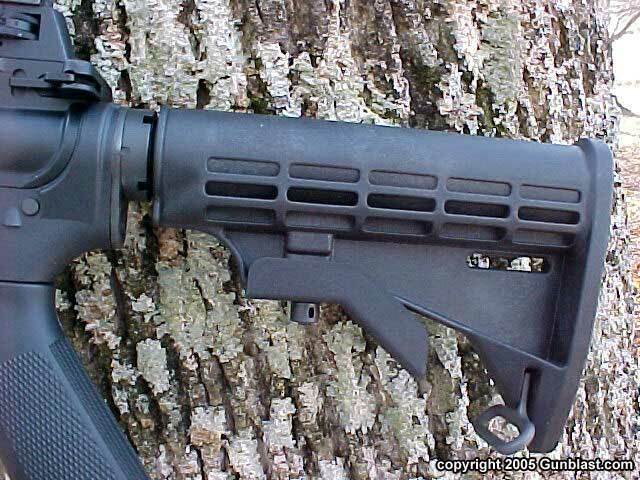 Upon first look, it appears to be an AR-15 M-4 carbine. 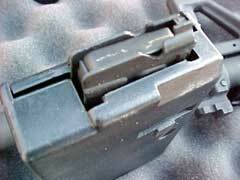 All of the attachments and hardware look to be mil-spec parts and pieces. The sixteen inch barrel wears a birdcage, closed-bottom flash suppressor, and has the familiar M-4 step in the barrel. 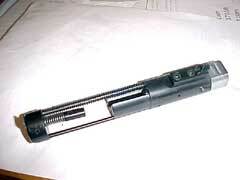 It also wears a bayonet lug at the bottom of the front sight/gas block unit. 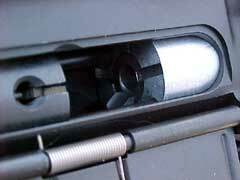 The short CAR-type hand guard is of the oval configuration. The upper receiver is the familiar A-3 type, with a detachable carry handle, that incorporates the rear A-2 style sight. 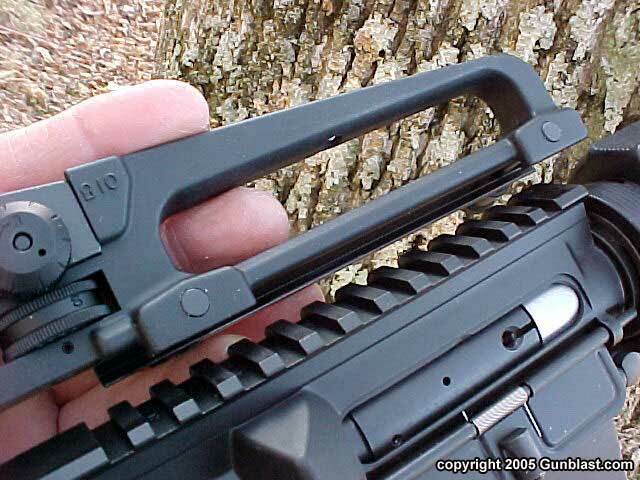 Loosening two knurled knobs detaches the carry handle, exposing a Picatinny flattop rail for the mounting of optical sights. The Panther AP-422 weighs in at just over six and one-half pounds. The Panther comes with two ten-round magazines, a cleaning kit, black nylon sling, instruction manual, and the hard plastic case. 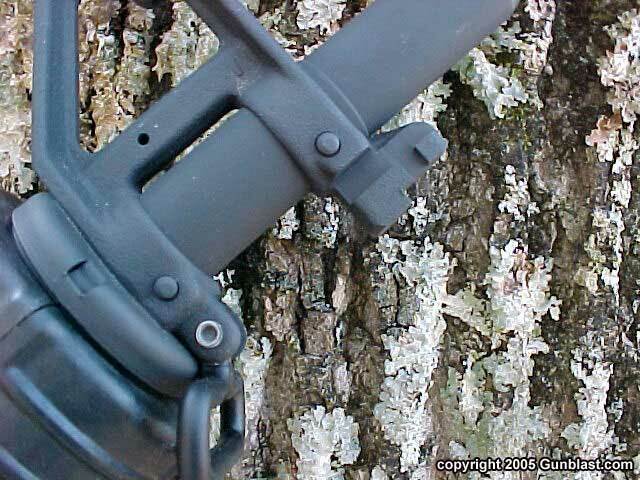 The sample rifle also has a six-position collapsible buttstock (a version with a pinned stock is available where the adjustable unit is prohibited), which makes it perfect for shooters of all sizes. 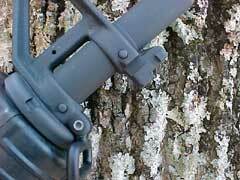 Having most of the features of the military M-4 carbine, the Panther is an excellent training rifle. Whether or not one likes the US military’s latest combat rifle, it is important that every young citizen is familiar with the weapon, and the Panther 22 is an excellent trainer. 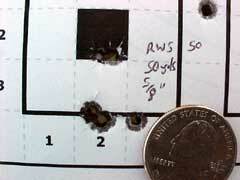 With .22 LR ammunition being so inexpensive that it is almost free, a shooter can shoot all day for about nine dollars. It was with this concept in mind that I proceeded with this article; that is, that the Panther 22 is a good understudy to the 5.56mm chambered rifle. 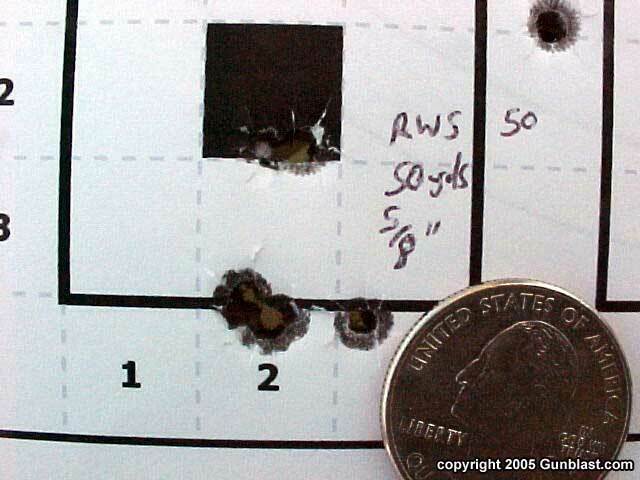 However, as I finished all of the measurements and photos, and got into the shooting tests, I then realized that this .22 LR carbine should not be limited to that role. While the size, weight, and controls are very much like its bigger brother, the Panther AP422 is also plenty accurate and reliable for other purposes as well. I have in the past tried .22 LR chambered ARs that were not very reliable, and was concerned that this Panther would be the same. 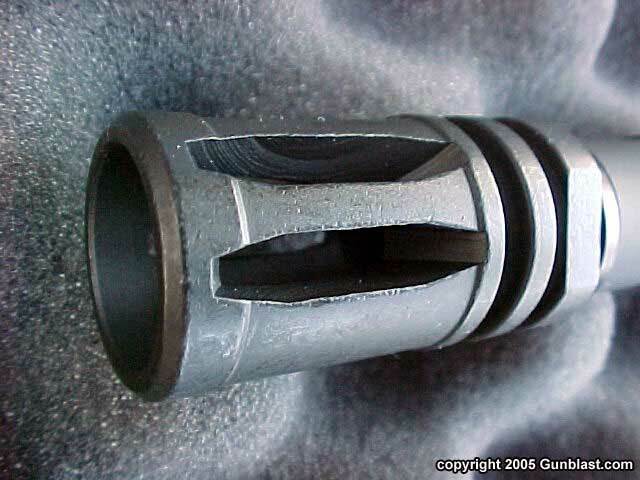 However, I am pleased to report that this weapon fed, fired, extracted, and ejected every .22 LR cartridge that I tried to feed it, except for one dud cartridge that apparently had no priming mixture in its rim. Anyway, it was no fault of the rifle. 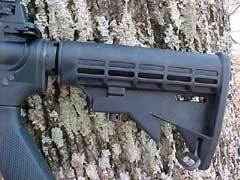 It is the first .22 LR chambered AR that I have ever handled that was one hundred percent reliable with several different brands of ammunition. 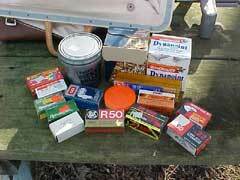 I tried every type of .22 LR ammo that I had on hand, and they all functioned perfectly. 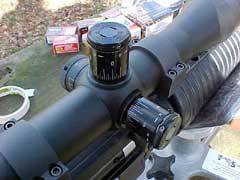 For accuracy testing, I mounted the excellent Leupold Mark 4, 4.5 to 14 power Long Range riflescope. It is a scope that has proven its repeatable accuracy to me in the past, and I trust it for testing the accuracy of rifles. The Panther shot very well, with most common hunting type cartridges grouping within one and one-half inches at fifty yards for five shots. 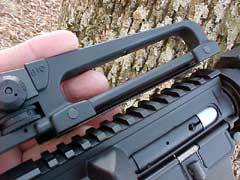 My only gripe with the panther is the trigger pull, which is typical AR; about six and one-half pounds. As it is intended to be a training rifle, I guess that it is appropriate that it have a military trigger pull also, but I do better target work with a lighter trigger pull. 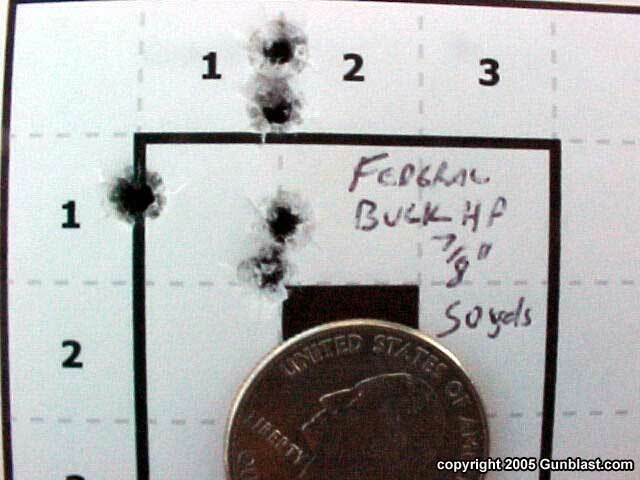 Some brands of ammo did turn in very good accuracy, grouping between five-eighths and one inch for a few of the types tried. 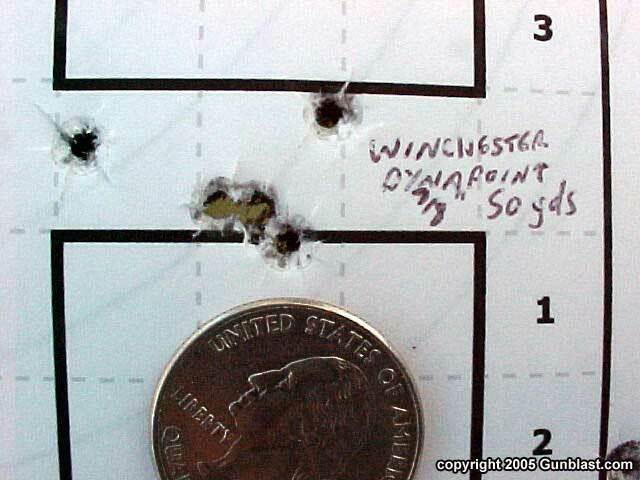 Winchester Dynapoint hollowpoints, which I buy in bulk, grouped 100 rounds into just one and one-quarter inches, rapid fire, with but a couple of stragglers. 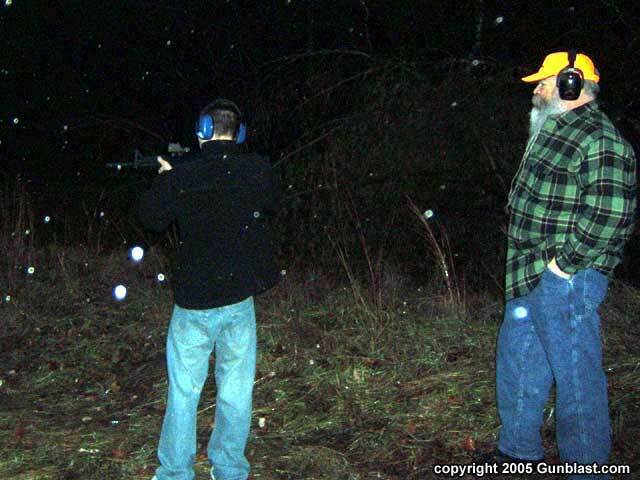 This group was fired as fast as I could load the magazine and fire the weapon at the target, emptying the magazine in about six seconds. That is very consistent performance with the ammo that is my favorite for hunting small game; the Dynapoint. Perhaps DPMS should market this rifle towards squirrel hunters. It is certainly plenty accurate for such work. 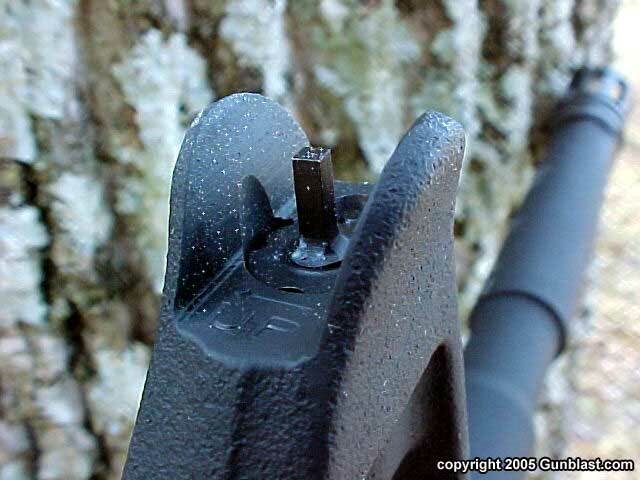 The AP422 operates on the blowback principle, as can be seen in the picture of the bolt. Minimal maintenance is needed. Cleaning the bolt and lightly lubricating with a good synthetic light oil, such as Break Free or Militec will keep it running. Differing from the AR-15, the bolt does not stay open after emptying the magazine, and the dust cover will not close on a closed bolt. Otherwise, the controls work the same as on the AR-15/AR-10 weapons. This is an excellent training tool for youngsters and teenagers. During the testing of this weapon, I was assisted by Alex Lacey, a high school Junior Reserve Officer Training Corps (JROTC) Captain. His high school program uses bolt action .22 rifles, and this was the first AR type weapon that he has fired, but he took to it immediately. We set up a steel six inch swinging plate at about 40 yards with a Trijicon Reflex tritium dot sight atop the Panther. 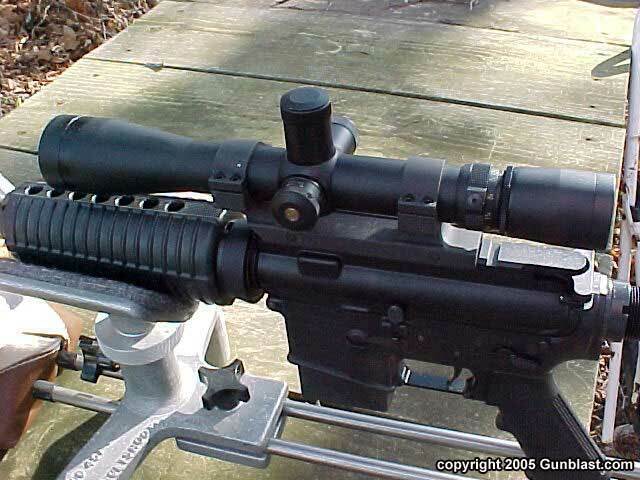 This makes for a weapon/sight combo much like that used by many units in Iraq. 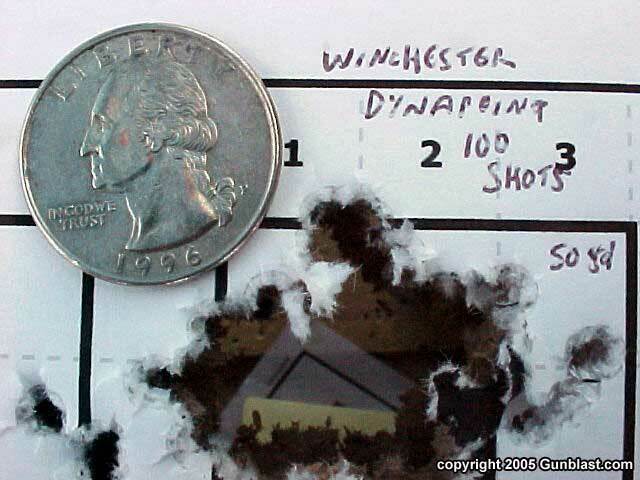 Captain Lacey turned in an excellent performance with the Panther, missing only twice while emptying several magazines full of the Winchester Dynapoint ammo. He will soon be shooting the 5.56mm and .50 Beowulf ARs, and will be very familiar with the weapons system before entering basic training in a couple of years. The adjustable six-position buttstock and minimal recoil of the Panther AP422 makes for a good target or hunting rifle for adults or teenagers of any size. 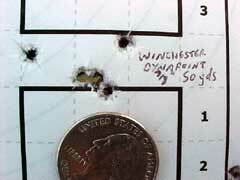 The Panther proved to be reliable, accurate, and just plain fun to shoot. Check out the entire line of DPMS Panther rifles online at: www.dpmsinc.com. 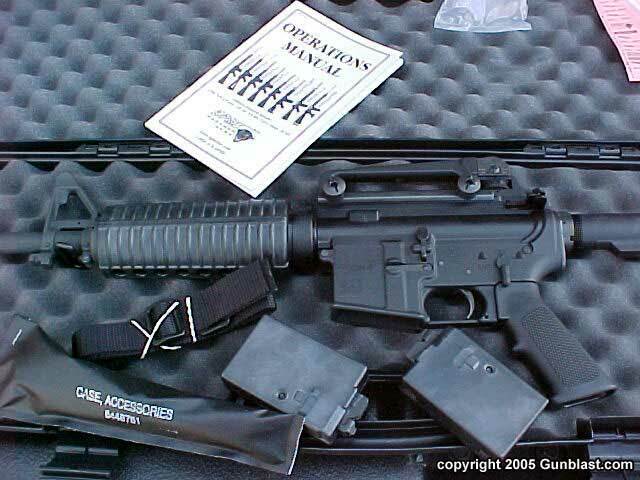 To order DPMS rifles online, go to www.lowpriceguns.com. 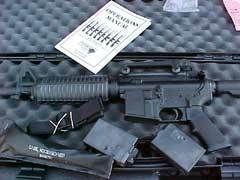 DPMS' AP-422 comes with two magazines, plastic carrying case, sling, cleaning kit, and operations manual. Captain Alex Lacey (JROTC) assisted in the testing of the Panther AP-422. The AP-422 features (top to bottom): flash suppressor, ten-shot magazine, six-position buttstock, and detachable carry handle/rear sight assembly. The AP-422's bolt is blowback-operated. 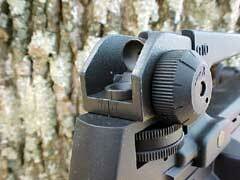 As a general-use optical sight, Trijicon's reflex sight is hard to beat. 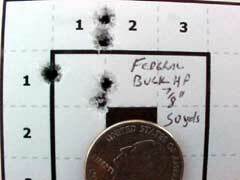 Author tested the AP-422 with a good variety of .22 LR ammo. For serious accuracy testing, Jeff likes to use a serious scope: Leupold's Mark 4. The AP-422 proved to be plenty accurate not only for casual plinking, but for serious target shooting or hunting as well.